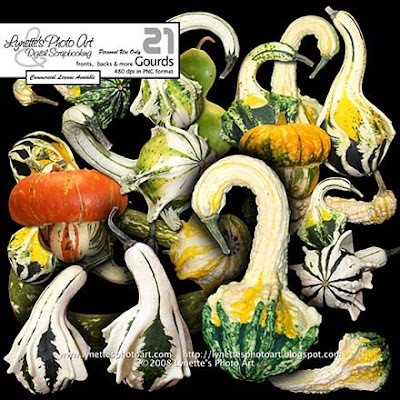 We are done with the buttons and now here are the rest of the fantastic gourds I promised you for your fall layouts! These are truly remarkable and I hope you enjoy them as much as I am! I'll be giving them away every day till you have them all - 19 downloads in all. I gave the first two away earlier. If you missed them, look in the archives in the left column for the post "Hallelujah". The link is still good! I'd truly love to see what you make with these beauties, so send me a link!